And this is true. Thank you so, so much for the amazing responses today and yesterday to my NEDA post; one reader suggested putting them in PDF format so that anyone who found the discussion useful could access them easily. Not a bad thought. 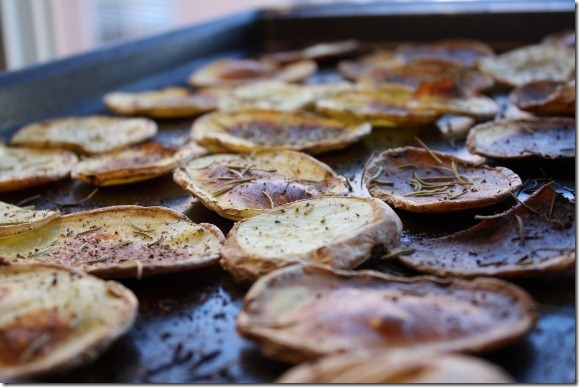 Getting back to food, I recently promised you a recipe for yukon gold potato chips. Have you noticed that when I promise to post something “tomorrow” or “later this week,” what I usually mean is “three weeks from now?” Sorry, guys and gals. These potato chips are coming at you a bit late. But they’re no less delicious for the delay. The recipe really couldn’t be any easier. It all began with M’s famous delivery box, and the six or seven yukon gold potatoes we didn’t know what to do with. M suggested baking them, but the thing was, it was past lunchtime, and I was ravenous. And when I’m ravenous, I’m no fun. So a forty minute bake was out of the question. Unless, of course, we could slice the ‘taters so thinly that they’d crisp up quickly. Which is exactly what we did. Using M’s mandoline, I cut two large potatoes into thin slices (I’d say 1/8-1/4 inch is fine). I tossed them in a “glug” of olive oil—maybe 2 tbsp or so—and sea salt and black pepper. I then laid them out on two baking trays and sprinkled them with just over a tablespoon of dried rosemary and another dash of pepper. After about 25 minutes at 400 degrees, they were crispy, crunchy, salty, and superb. 1) Baked, not fried. These golden-brown treats are some raw foodists’ idea of a nightmare. But I think that balanced diets of raw and cooked foods can allow for some burnt edges here and there. And if you’re hooked on conventional chips, these guys are less caloric and lower in fat. 2) Gluten free-friendly. If you’re avoiding gluten, but missing your favorite crackers, these are good enough to distract you. Possibly forever. Or until you make them again. 3) Whole food snack option. Enough with your fancy organic crackers and crisps from Whole Foods or your local health food store. Those are yummy, but they’re also making you go broke. OK, maybe not, but these are the real whole foods: nothing but potatoes and spices. I’d recommend them any day as an alternative to conventional crunchy snacks, which have probably been through at least one level of processing! 2) Toss the potatoes with 2 tbsp olive oil, salt, and pepper in a mixing bowl. 3) Lay them in a single layer on a baking sheet, and sprinkle the rosemary on top (as well as extra pepper if you like). 4) Bake for 20-25 min, or until very golden and crispy (this will vary with your oven). 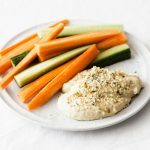 This one worked nicely with up in smoke hummus! Chard! Beautiful chard! That smile tells you everything you need to know about my reaction to fresh greens. Mmmm… Yukon golds are my favorite potato! They make the best golden mashed potatoes. The chips look delish, too! Love the look of these chips! I’ve only made wedges before. I love rosemary with potato too! These look absolutely phenomenal. I love rosemary! Thank goodness I have potatoes in my refrigerator. I’m thinking I’ll be making some of these very soon! Gena, these chips look WONDERFUL!! But seriously, these look awesome! I love that they are baked not fried and GF friendly. They look like the crisped up wonderful and that possibly (if I could make enough to actually have leftovers) that I could baggie-them up for on the go snacks. Gosh, I am drooling here…. And your new About picture and page…lookin’ good there! yeahhhhhhhhhhhhhhhh. so easy. must get yukons asap. This post came at the perfect time! I just got two potatoes in my co-op box today and was wondering what to do with them, but luckily I have sea salt and rosemary on hand so I can make these! Yay!! I absolutely loooove making homemade, and I particularly love the ones that are thinner and crunchier than the rest… I think it’s a sign that I need to make these chips! I love how you can make a whole bags worth of chips for way less, and they’re healthier and tastier with zero waste. fries! I love making homemade fries. I love baked veggie chips! 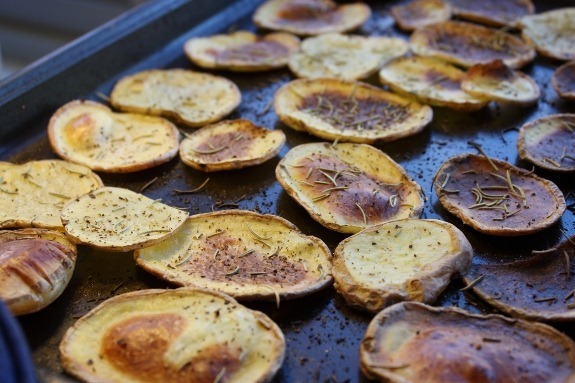 I did some sweet potato chips just like these – will have to try it with yukons. After years of not loving regular potatoes, I am just starting to get back into them. This seems like a lovely recipe featuring the good ole’ potato! this reminds me of my failed attempt to make chips like this with sweet potatoes. I think they burned before they could get crispy. maybe white potatoes are just the best for chips. yes I know a few raw foodies who would run screaming from these, but then again some of the same I see sneak chips at vegan/raw joint events. i like the idea of making your own chips because the ones in the store are way too salty for my palate now. I love, love, love rosemary…I bet the same spice blend would be fantastic on sweet potato chips too! Hope you are having a great week, hon. I totally agree about the comments section! 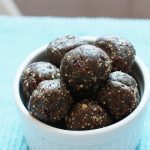 This is so crazy–last week a friend of mine suggested that I make these (and I did, and they were awesome! ), and them Evan from Wannabe Chef and you both blogged about them. But what my friend said (and this is important for me) is that you don’t need any oil at all, you can just bake the thinly sliced potatoes with whatever seasoning you want . . . extreme right?!? Well, it worked! And now I know what to do with all of those potatoes that I get in my organic veggie share every other week. Cause prior to this “discovery” I ended up with a biology experiment in my pantry. I love! Healthy chips are the bestest, especially since I do not have a dehydrator! 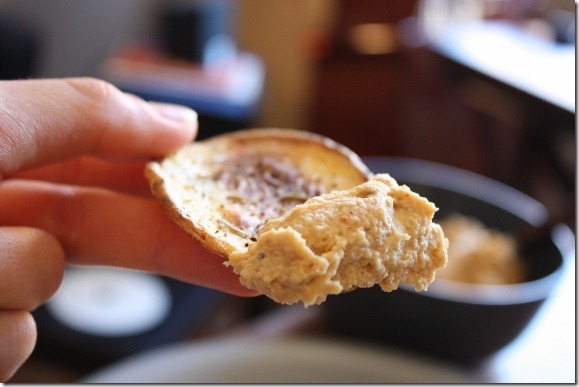 Love the simplicity of this healthy chip! Question, have you ever tried potatoes in the dehydrator? Wonder how they would work? That picture is a framer! Love the new photo – very clever! I absolutely love making potatoes this way. 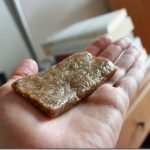 The only problem is I never make enough – when they are cut that small and delicious it’s easy to eat wayyy more than I thought I would! I have a snacking problem when it comes to potato chips, so I can’t wait to make these. It looks so easy! I’m guessing any waxy potato could be used, so I think I’m going to try these tonight using some of the red potatoes I bought yesterday. 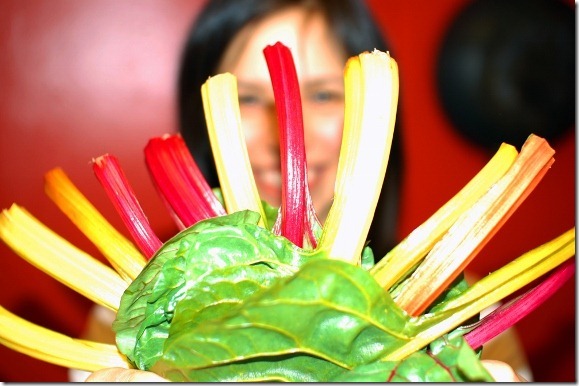 And I love rainbow chard – it’s so beautiful! These look great! I would like to try this recipe with sweet potatoes too. You had me at rosemary sea salt. One of the best combinations…EVER. And for some reason on potatoes, even better! LOVE the rainbow chard photo!!! If loving cooked potatoes is wrong, I don’t want to ever be right. Maybe I am an extremist but these aren’t raw. I have not tried potatoes in the dehydrator, do you think that they would work just as well in a dehydrator? It sounds wonderful, so I would like to try it out. They sure aren’t! I’ve tried regular and sweet potato chips in the dehydrator; I didn’t love regular, but I did really like the sweet potato chips, so I’ll post that recipe soon. Thank you, that would be great. Sorry for the offense. I love your blog and you seem like a great person. I’m always subbing out the regular potatoes from my produce delivery box (which I’m guessing is the same as M’s!) because I never know what to do with them. Gena to the rescue again! Won’t be subbing them out next time. As for the rainbow chard, pretty and delish. So exciting when it’s part of the produce box! I got a bunch of little potatoes in my CSA box I’m still trying to figure out what to do with, I might try this recipe with them. Thanks for the recipe and love the new picture! Yum! 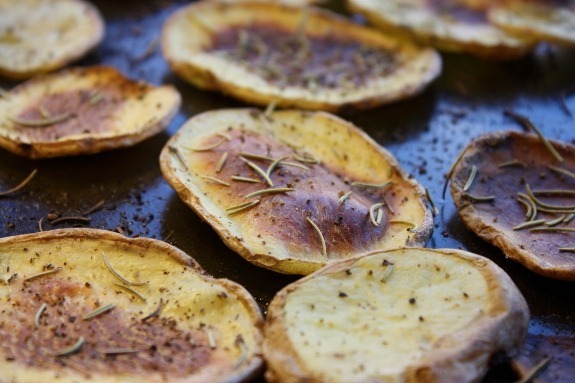 I just love those.. potatoes, rosemary and olive oil is a winning combo! I love the pic of you too… I adore greens so much that I often talk to them and cradle them like a baby .. especially when they are freshly picked. Oh my! I am somewhat new to your blog and I had to comment once you said the comment section keeps you going. All of your recipes look AMAZING and I cant wait to try them out! I LOVE your approach to nutrition. Its so nice to feel as though I have found a good place to search recipes that are compatible with my own idea of what food should be like. Its not easy!! Far too many times I have tried to google a recipe based on certain ingredients and was lead to recipes that begin with something like “Take one can of condensed cream of chicken soup and mix with half a jar of cheese spread…” Gah!!!! Thanks so much for sharing the wisdom that most of us need to know but have no idea how to get it. yay! Thanks Sylvia. Please keep reading. Love the chips, love the pic! I think these are going to be the perfect appetizer for our next family dinner – mmm! Those look fantastic – great photo! Wow, chips were a suprise on CW, but you’re right they are whole and healthy! I am convinced there is nothing that hummus does not pair with! Your recipes all look so wonderful! I’ve been going through quite a few of them lately but I’m running into a slight problem- I’m allergic to bananas and I noticed they’re in quite a few of the recipes. 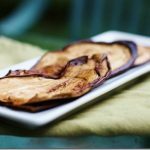 What would you suggest as a good substitute for bananas in recipes? Just 2 weeks ago I decided I wasn’t buying anymore chips (Potato or tortilla or even Beanitos — my fave) no matter how healthy they may be. I was done with the extra ingredients and sooo done with the packaging that just ends up in landfills and poisons our beautiful planet. I’ve now mastered homemade potato chips. I’ll try adding some rosemary as you did. I’ve also now mastered tortilla chips and even made my own homemade version of Beanitos chips. I feel good eating them for dozens of reasons. Thanks for your recipe. Hopefully many people will start making their own chips. Those look delicious! 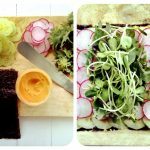 I just found your blog and just want to say that despite the name “choosing raw” (which I’m totally into!) I’m happy to see you also feature cooked foods. Moderation is key! Love that photo! So bright and vibrant! This is what I love about raw, living, wholefoods. The colours are so life giving.